The eleventh hour of the eleventh day of the eleventh month, now known as ‘Remembrance Day’, marks the moment when hostilities ceased in World War I, through the signing of an armistice between the allied forces and Germany on 11 November 1918. In that year, celebrations of the milestone began early in Sydney, which saw days of jubilant crowds gathered in the streets, after four years supporting the war effort from the home front of New South Wales. The year 1918 had initially caused anxiety for the government and people of New South Wales, with the German ‘Spring Offensive’ in France in late March and early April bringing the allied forces the closest it had come to losing the war..
August 1918, however, saw a shift in fortunes for the allies, and victory became increasingly likely by early October. 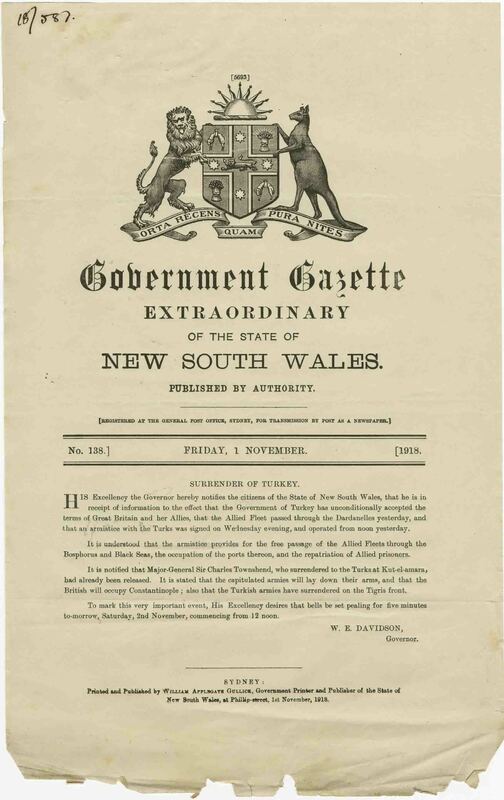 In early November, the New South Wales Government published notice of the surrenders of first Turkey, and then of Austria-Hungary, in its Government Gazette. Thereafter, the people of New South Wales were anticipating news of an end to all hostilities..
On Friday morning, 8 November, word reached Australia prematurely of an armistice with Germany having been signed. Newspapers like The Evening News and The Sydney Morning Herald stated on the 8th that the Paris correspondent of the United Press had reported that it had been signed on the 7th, and that hostilities had ceased at 2 pm., Without official word from the Government to confirm the news, many restless workers across the city and suburbs left work for the day. Government Railways employee Thomas Channon and his colleagues left work to join in the celebrations, with blessing from the Railway Commissioners on the condition that staff who left would not be paid. This decision was later reversed, and all Government employees who left work early on the 8th were paid.. Channon recalled that “every conceivable noise was made” from about 10am, including the “blowing of railway and mill whistles, bells ringing and cheering from all over the place.” Celebrations through Sydney streets were concentrated in the form of a dense crowd at Martin Place, in the expectation of an official announcement from the NSW Government, which never came. The papers admitted the following (Saturday) morning that the reports had been ‘premature’, although it did not stop celebrations resuming again later that day..
On the night of Monday 11 November, official news finally arrived in Sydney after 7pm (11am Paris time) confirming the signing of the armistice on the other side of the world. By 9pm the streets of the city were filled with celebration converging again on Martin Place. However, announcements and speeches by members of the Government were not able to be delivered over the noise created by the jubilant crowd, until the following day – a public holiday declared by the Commonwealth Government. 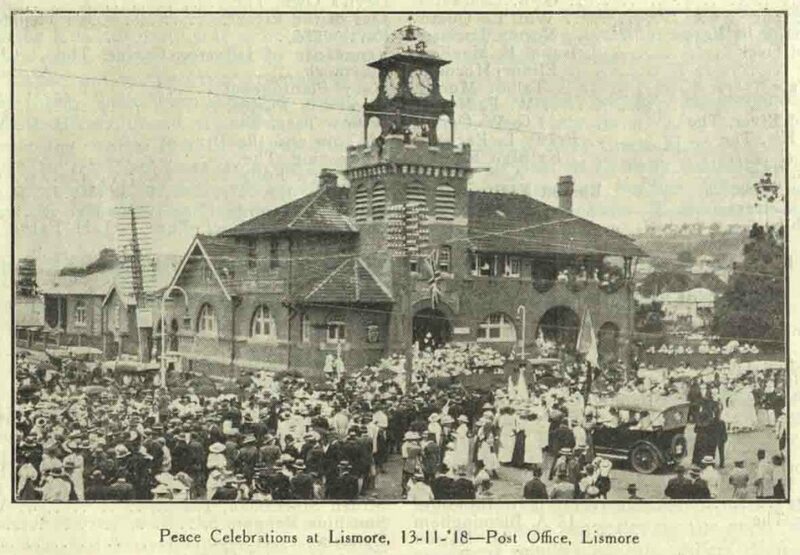 This was followed by a NSW public holiday on Wednesday the 13th, which meant there had been almost daily celebrations since the previous Friday..
Perhaps this explains the situation in which the Mayor of Bingara enquired urgently on 12 November with the NSW Chief Secretary’s office, for official news of the end of hostilities. The mayor’s enquiry was not replied to until 16 November, by which time the answer was no doubt already known. 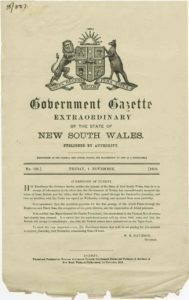 The Chief Secretary himself, George Black, perhaps summed up the feelings of many in the NSW Government when he shared his thoughts about the end of the war in the Legislative Council’s ‘Address of Congratulations to the King’ on 13 November. Although he felt “charmed…beyond all measure” to see the (premature) celebrations in Sydney the previous Friday, he remarked that he “could not enjoy it as [he] would have done under other circumstances, because of the sadness which [he] knew was in many hearts.” He went on to say that the people of NSW: “…gave us everything – their comfort and happiness, their lives, and all their hopes of long and happy lives. We can give them nothing in return save our eternal gratitude.” Black and white photographs of illuminated addresses based on these sessions of parliament, which were presented to King George V, are viewable below. From celebrations in 1918, the 11th of November became a day of commemoration known as ‘Armistice Day’ the following year – a time of reflection and remembrance of the war dead. The day became Remembrance Day after the Second World War, and continues to this day, with 2018 marking the centenary of the signing of the armistice which ended hostilities in World War I.